After Savich stops a crazy man from harming a pregnant woman, the man unexpectedly falls into a coma. Doctors discover a drug in his blood they can’t identify, and his only identification is a yellow wrist band marked E 2. Did this John Doe escape from a mental hospital? And why was he at the pregnant woman’s house? When her newborn baby is kidnapped from the hospital Savich realizes there’s a connection between the kidnapping and the unconscious John Doe. DNA tests uncover a startling fact: his cells are unlike any other—he’s an Enigma. Meanwhile, Liam Hennessey, aka Manta Ray, a convicted bank robber, escapes from the Federal Marshals on his transport to a federal penitentiary. He and his “handlers” are seen going into the Daniel Boone National Forest. Savich sends Agents Cam Wittier and Jack Cabot after them. "Bestseller Coulter is at the top of her game in her 21st FBI thriller ... Twists and turns galore in both investigations ensure there's never a dull moment." 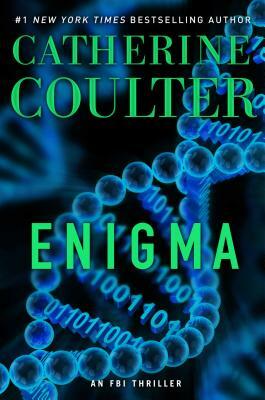 "Enigma is a new seductive and menacing thriller that sets new standards to judge thrillers. It’s a thriller most people would like to finish it in one sitting. It is intense and packed with action and inventive fantasy Catherine Coulter is known for. This must be next on your reading list if you love to read thrillers." "A master of smooth, eminently readable narratives."